Back in August 2011, the old Fox and Fiddle Pub building which stood at 106 John Street was moved across the road. I did a post at the time which showed time lapse photography of the move from one side of the road to the other. This past weekend it was moved to its new location, a few doors south of where it originally stood. Here is the original location. The reason it was spared demolition was its historic value to the city. It is one of the last of the style of homes which were built in the city back in the late 1800s. This one was built in 1869. I found it interesting that they did not line up this building with the old building which still stands. According to a very interesting article on the move in Urban Toronto, it took just under 4 hours to move the building across the street. This building will be turned into retail space once the new building is built in behind. The article has some great pictures of the move and is worth a read. All the pictures in this post are mine except for the picture of the original pub. It'll be interesting to see how it all turns out in the end. One final picture here. The building with the Daniels sign on it has historical value in it too. 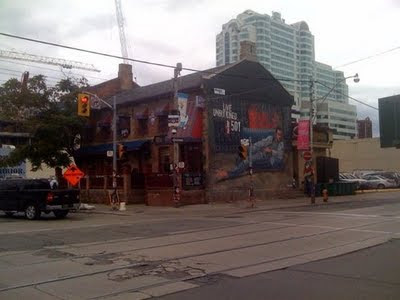 Once it was the Duke of Argyle and was the site of the Teena's and my very first official date on December 24, 2001. For that reason alone, it is worth preserving.